Ahi tuna is one of those ingredients that are best served rare. I just can't imagine cooking ahi tuna for very long because for one, it comes out a really unappetizing gray and the texture is so dry. So to really give ahi tuna the proper preparation, you should really serve it rare to medium rare. A great way to do this is to make Ahi Tuna Tartare. These little colorful and refreshing bites make for a delicious presentation and popular appetizer! Cut the tuna into 1/4-inch dice and place it in a very large bowl. In a separate bowl, combine the olive oil, lime zest, lime juice, wasabi, soy sauce, Tabasco sauce, salt, and pepper. Pour over the tuna, add the scallions and bell pepper mix well. Cut the avocados in half, remove the seed and peel. Cut the avocados into 1/4-inch dice. Carefully mix the avocado into the tuna mixture. Add the toasted sesame seeds, if using, and season to taste. Allow the mixture to sit in the refrigerator for at least 1 hour for the flavors to blend. Meanwhile, using a peeler, remove strips of the skin lengthwise off the cucumber, alternating the look of light green cucumber flesh and dark green peel. Slice the cucumber into 1/2 inch slices and remove the inner seeds just enough to create a small bowl or indention. 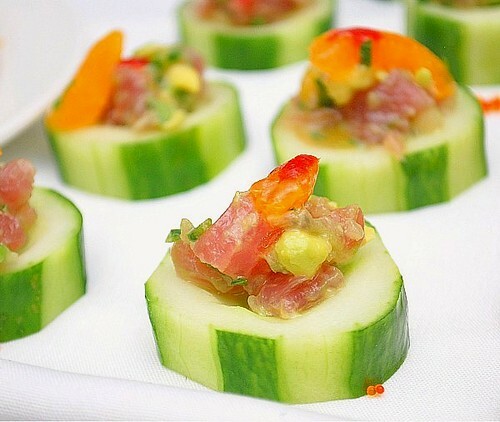 Carefully spoon the chilled ahi tuna tartare into the middle of each cucumber slice and serve. These are beautiful little bites. I'm craving tuna tartare now... maybe I'll try these for NYE! Great post. I love tuna tartar but most of the recipes I have include some sick amount of mayo. I love that this one is kept healthy and served on cucumber. I'd love to share this with my readers! These make gorgeous appetizers! Congrats on making the Top 9! Beautiful presentation, Joelen! I'm kind of new to the raw tuna bit, but I just had something similar to this in a local sushi restaurant and loved it. I'm now eager to give this a try! Congratulations on a well deserved Top 9! I have finally come to the conclusion that to cook tuna, at least Ahi, is to ruin it. It has far better flavor, texture, and visual appeal served either as tartare, or sliced as for sashimi. I am a convert.